John Feeney arrived in Egypt in 1963 to make a documentary film, intending to stay for one year and staying forty. Photographing Egypt brings together some of his now rare color photographs of Egypt, taken over the past forty years and displayed in a major retrospective exhibition of his work in March 2005 at the American University in Cairo’s Sony Gallery. 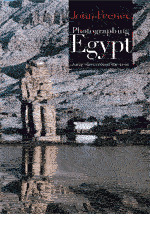 The photographs depict the epic grandeur of Egypt, and include historic pictures of Gamal Abd al-Nasser’s funeral cortege leaving Qasr al-Nil Bridge and of the last Nile flood to come to Egypt, as well as aspects of the country rarely dealt with previously—the unique domes of Cairo, the extraordinary multicolored pavilions of the Tentmakers’ Street, the gathering of jasmine blossoms in the Nile Delta, the search for the elusive desert truffle, the shadow puppet plays of Cairo’s street theater, and the hammams of the medieval city. The photographs are accompanied by extracts from the photographer’s narration to his Nile film Fountains of the Sun, and from his essays that have appeared over the years in Aramco World Magazine.